Ideal for smoking cessation programs and CO poisoning/smoke inhalation screening. The MicroCO is an innovative Carbon Monoxide Monitor designed specifically for use in busy Surgeries and clinics, combining accuracy and simplicity at an economical price. Used for both smoking cessation programmes and CO poisoning/smoke inhalation screening the easy to read display indicates both Carbon Monoxide concentration in ppm or %COHb. With all electrochemical gas sensors regular re-calibration is required and a rapid, economical factory re-calibration service is available for locations unwilling to store Carbon Monoxide on their premises. Typically, the calibration will remain stable to within 2% for 1 month and within 10% for 6 months. For customers wishing to perform their own calibration, a certified calibration gas of 50 ppm CO, balance N2, is required. Supplied with all accessories in a sturdy carry-case. 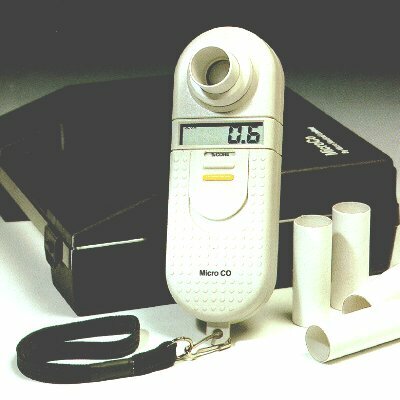 The MicroCO is powerful diagnostic tool for measuring Alveolar Carbon Monoxide concentration and the percentage Carboxyhaemoglobin. Operating from a single 9V PP3 battery for approximately 30 hours and using standard 22mm mouthpieces MicroCO is the most cost effective CO monitor available. Measurements are easily obtained from a single expiration and are aided by an auto-zero function at turn on, combined with a breath hold timer. These results are then displayed on the large, easy to read liquid crystal display. The MicroCO is supplied complete with all necessary accessories in a sturdy carry-case. Ergonomically designed unit of distinctive appearance, the textured handgrip encourages easy and reassuring use. The MicroCO is small and light-weight, moulded from high impact ABS for durability and apart from the requirement for regular calibration is virtually maintenance free. Included (free) "Cobra" software offers a simple solution for performing and storing carbon monoxide breath tests on a PC. for shipping add $ 17 hazardous handling fee.